"Shawn Carter was born December 4th, weighing in at 10 pounds 8 ounces. He was the last of my 4 children, the only one who didn't give me any pain when i gave birth to him, and that's how i knew that he was a special child". Shawn's mom must have told me this story literally over a thousand times and it still never gets boring to me. I guess every mother thinks her child is special and tells stories like this to whoever (they think) wants to listen, but I highly doubt that there is another mother on this planet whose story has been heard by an audience as broad as the people that listen to Shawn Carter's mom on a daily basis. I mean what do you know about Martin Luther King's birth? Have you ever heard specifics about Nelson Mandela's birth? No you haven't, but have you ever been told how much Shawn Corey Carter weighed when he was born? Yes, you have. And if you haven't, then you have now. So today is the birthday of Shawn Carter, probably better known as Jay-Z, and in his honour I listened to The Black Album today. Maybe not his best album (which is The Dynasty) but certainly the one I listen to the most. I saw Jay-Z play a show in Belgium, and still stand by my saying that this was one of the best live performances I've ever witnessed. Most rappers I've seen so far bring out a DJ and a couple of up-and-coming rappers that get their 3 minutes of fame every night on tour. Hova on the other hand brought out an entire band, background choir, trumpet section and ofcourse the obligatory guest emcee's too. Jigga was communicating with the crowd, did some amazing freestyles and was just genuinely enjoying himself and loving the music. 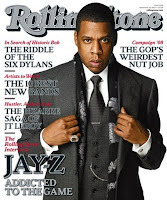 So here's to Jay-Z: congratulations Hova! I'm throwing my ROC-sign up right now! And if you can't respect that your whole perspective is whack, maybe you'll love me when I fade to black.